15. 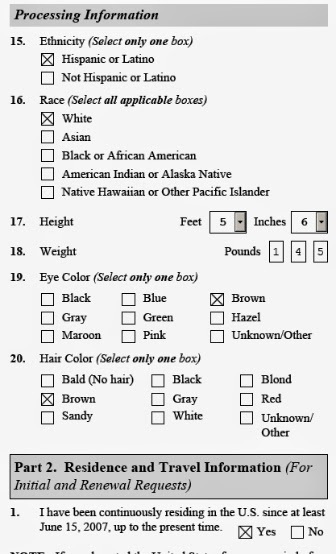 Ethnicity: You are either a Hispanic or not. So just check the right box. 16. Race. Don't make it too complicated and pick the right one. You can have more fun with this question when you complete your census form. These are the categories law enforcement uses to identify criminals and suspects and this information will be used for that purpose. 17. Height: Select the right number from the pull down menu. 18. Simply enter the weight in pounds. If you are less than 100, enter zero in the first box. 19. Simply pick your closest eye color and this too is for identification purposes. 20. Hair color selected should be the natural color you have. Do not write the color you have now because you dyed your hair.